NASCAR Hall of Fame news headlines are found here. The NASCAR Hall of Fame located in Charlotte, NC honors drivers who have shown exceptional skill at NASCAR racing, all-time great crew chiefs and owners, and other major contributors to competition within the sanctioning body. Last night, the NASCAR Hall of Fame inducted new members. It was a dinner featuring the entire industry. The now retired Dale Earnhardt Jr was on hand for the show in Charlotte, NC. The NASCAR snapchat caught up with the former #88 driver to ask some questions. DAYTONA BEACH, Fla. (Dec. 7, 2017) – NASCAR and Whelen Engineering, Inc. announced today multi-year extensions to continue its entitlement sponsorship of the NASCAR Whelen Modified Tour and the NASCAR Whelen Euro Series through 2024. Yesterday, NASCAR Hall of Famer Jack Ingram was seriously injured in a car accident. The accident took place in his hometown of Asheville, NC. Yesterday, NASCAR released the 2018 Monster Energy NASCAR Cup Series rules package. The highlighted change is the mandated front splitter that will become a standard spec splitter for all teams. NASCAR and Comcast released a new NASCAR XFINITY Series identity mark on Tuesday, with a full rollout coming in 2018. The new look was broadcasted onto the big screen at the NASCAR Hall of Fame as NASCAR XFINITY Series Playoffs Media Day was underway across the street in Charlotte. DAYTONA BEACH, Fla. (Jan. 20, 2017) – Five of NASCAR’s legendary competitors – three owners and two drivers – were enshrined via the 2017 NASCAR Hall of Fame Induction Ceremony. CHARLOTTE, N.C. – It was the fourth time Doug Coby took the stage to accept a NASCAR championship ring. As the elder statesman on the stage, the Milford, Connecticut, driver took a moment to reflect. The NASCAR Hall of Fame looted and vandalized overnight in Charlotte, NC. Windows shattered, signs hanging through glass on the $195 million dollar museum. 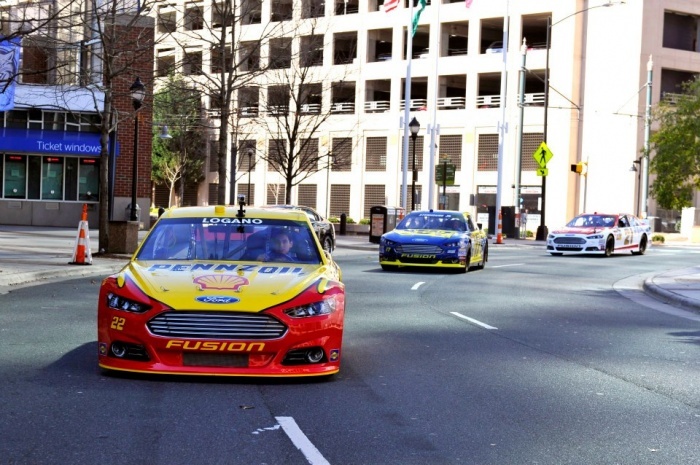 A state of emergency declared on the city, the home of NASCAR. A passionate and innovative pioneer in the sport of auto racing, Bristol Motor Speedway owner Bruton Smith was inducted into the NASCAR Hall of Fame Friday, after dedicating his life to creating unforgettable at-track experiences for millions of race fans across the country.